The early summer weather has been a welcomed change at INK. On the exterior, the team is busy finishing the rooftop patio and installing patio railings. On the inside progress is on point with the second floor almost done (appliance install and final touches up next) to the fourteenth floor where framing is complete and drywall will be hung shortly. Parkade – white paint will be rolled on shortly to brighten the parkade. Main Floor – Studs are in on the ground floor delineating rooms and hallways. 4th Floor – Trim is being cut to size and mounted. Appliances are onsite. 5th Floor – The flooring has been stained and trim installed. Appliances are onsite. 6th Floor – Stain and sealant are being poured finalizing the polished concrete floors. 7th Floor – Stain and sealant are being poured finalizing the polished concrete floors. 8th Floor – Stain and sealant are being poured finalizing the polished concrete floors. 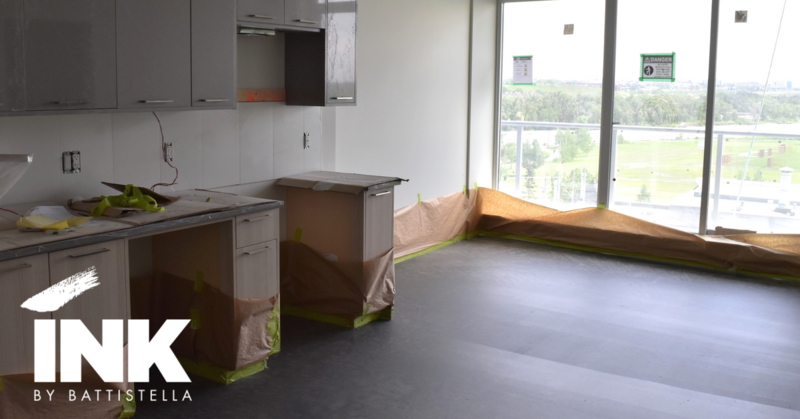 9th Floor –Tile is going up in the bathrooms and kitchen. 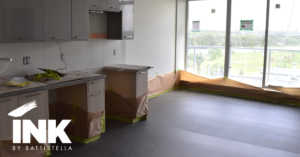 11th Floor – Boxes of cabinets are on site and are soon to be assembled. 12th Floor – Patio railings and glass are being mounted. 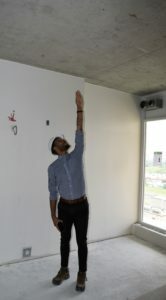 13th Floor – Drywall has been installed and mudding and taping are in progress. 14th Floor – The studs are secured framing out all the rooms. Drywall will be hung next. Rooftop – The final touches to the rooftop exterior cladding is in progress. Planting season here we come! Stay tuned for more updates. 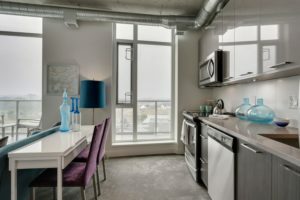 If there is anything specific you want to hear about let me know at info@battistella.ca.